The Organisation for Economic Co-operation and Development (OECD) released the April inflation numbers for its member countries today. Although we have known the U.S. inflation numbers for a couple of weeks now it is interesting to see how they compare to other developed countries around the world. Some of the biggest gainers were the United Kingdom (to 4.5% in April, up from 4.0% in March) and the United States (to 3.2%, up from 2.7%). Inflation also accelerated in Germany (to 2.4% up from 2.1%), Italy (to 2.6%, up from 2.5%), France (to 2.1%, up from 2.0%) and Japan (to 0.3%, after four consecutive months at 0.0%). Average consumer prices in the OECD area rose by 2.9% in the year to April 2011, compared with 2.7% in March – the highest rate since October 2008. The increase was driven by an acceleration in energy prices which grew by 13.8% in April, compared with 12.4% in March. Food prices rose by 3.1% in April, compared with 3.2% in March. This is less than the U.S. inflation rate of 3.16%. Inflation was stable in Canada (3.3%). Euro area annual inflation (HICP) rose to 2.8%, up from 2.7% in April. The picture was mixed in other major non-OECD economies, with some countries showing falls in the rate of inflation compared to last month. Consumer prices rose by 9.6% in the Russian Federation (up from 9.4% in March), 6.5% in Brazil (up from 6.3%) and 4.2% in South Africa (up from 4.1%). Inflation fell to 6.2% in Indonesia (down from 6.7%) and 5.3% in China (down from 5.4%). 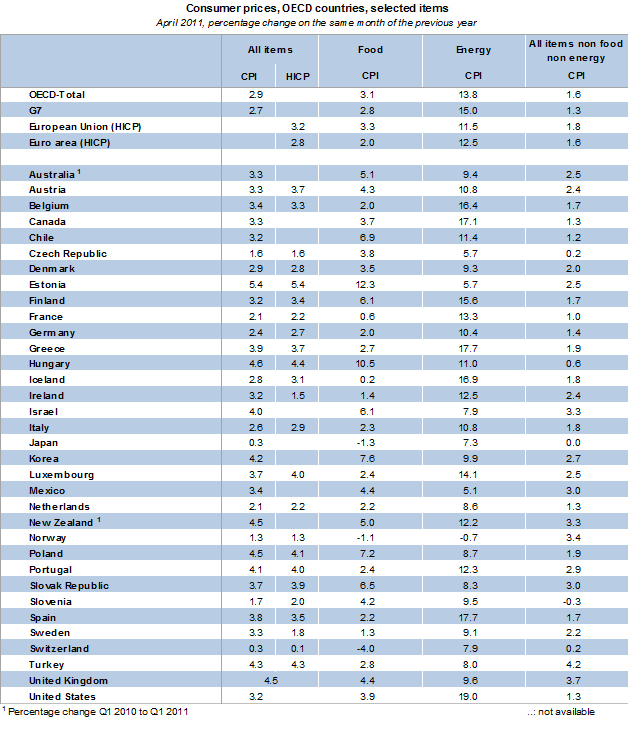 Here is a Table of OECD annual inflation rates for April 2011.